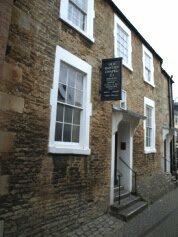 The Chapel is situated in the heart of Chippenham, just off the High Street. The Chapel is a listed building and there are five steps between the pavement and the entrance lobby. A mechanical 'stair climber' and trained operators are available to ensure that anyone unable to climb the stairs can safely access the Chapel. The High Street is a pedestrianised zone and unsuitable for access by car. The drop off area for less able passengers can be accessed by car from Emery Lane (see our map for details). To see a larger map and to view the parking and dropping-off information click here.